New Trends in the Peer to Peer Lending Industry 2018-2019 - Ignite Ltd. The peer to peer lending industry has been making waves since 2005, when the UK-based Zopa opened its doors. Since then, the industry has grown to $3.5bn, and continues to gain traction. P2P’s simplicity and efficiency, combined with a growing sense that traditional banks represent the polar opposite, mean that it’s quickly entering the mainstream. As with any business innovation, modern peer to peer lending is driven by technology. Fintech innovators stand to both profit and make a positive difference in the world. What is peer to peer lending, in simple terms? If you’re here, then you’re surely interested in stepping into the P2P space yourself. Maybe you’re already involved, whether as a bank, an entrepreneur, or a fintech pioneer. Whatever the case may be, it pays to stay on top of the latest trends in the space. Let’s look at what’s been happening in 2018, and what we can expect in the future. Some of the most dramatic news ever to come out of fintech happened this year in China. The Asian nation was the site of the largest growth in the P2P industry, with loans exceeding $217bn. Thousands of P2P companies were founded in China, with more seemingly every week. The unchecked growth led to a spate of bad debt, and investors were losing money. The government set a deadline of June 2018 for P2P companies to adhere to new, stricter business standards. By June of 2018, over 300 companies had gone out of business rather than comply, dropping the debt and costing investors dearly. 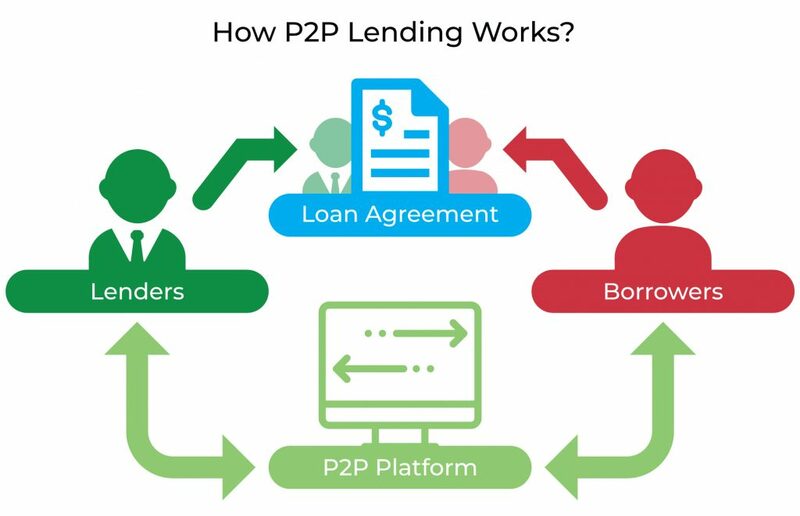 The end result is a wave of anger towards P2P, from both sides of the lending equation. For P2P entrepreneurs, it might be best to steer clear of China for the time being. Luckily, the outlook for the rest of the world couldn’t be brighter. In Brazil, for example, the Central Bank has just formally authorized peer to peer lending nationwide. Fintechs had already been operating and providing loans, but the new regulations mean they can enter into direct competition with institutional banks. Similar moves are expected shortly in India, where the Reserve Bank of India (RBI) has published guidelines to be ratified into law. Other countries where P2P lending is relatively new, such as Indonesia and Israel, are seeing rapid growth in the industry. In Australia, the government encourages the introduction of fintechs to the economy through a “regulatory sandbox” allowing for startups to operate without a license for up to 12 months. Similar stories abound, and it seems clear that fintech is a global trend. Meanwhile, traditional banks are seeing the power of P2P. Although a few early attempts were notorious failures, today multiple banks are either backing fintech entrepreneurs, or launching their own entries in the space. Banks see the power technology brings to the table, such as Prosper’s alternative means of determining loan risk. Lending Club, a similar service, has seen banks sign up as clients for their platform, leveraging their scoring model for loan decisions. In fact, banks are now responsible for more than 25% of Lending Club’s total loans. Meanwhile, banks like Barclays are experimenting with P2P. The British multinational owns a substantial stake in RainFin, operating in South Africa. This is all good news for fintechs. It shows that banks are willing to engage with P2P, and that there will be opportunities with them in the near future. Finally, and perhaps more importantly, the consumers of the future overwhelmingly choose P2P. Gen X, millennials, and younger financiers have proven they prefer peer to peer lending over traditional loans. In Europe, over half of the substantial P2P market is comprised of people aged 22-37. They’re choosing P2P on the investment side of the equation, too. Research shows that investors aged 18-34 are four times more likely to put their money in P2P than investors over age 55. All of this points to one simple fact: The demand is there, and the future of peer to peer lending is bright. As long as the industry can continue to improve the quality of its offering, it will find plenty of consumers ready to chip in. When exploring any new tech trend, it’s always a good idea to look at those who have come before. 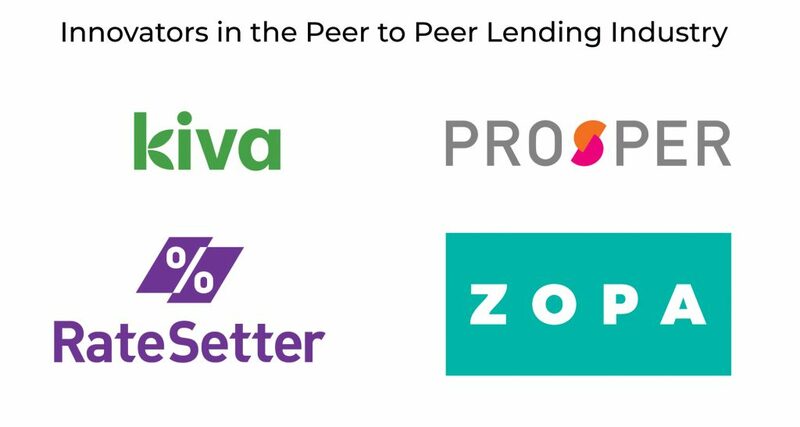 There are a great many companies making waves in P2P, and we’ve written more extensively about them in our 15 Peer to Peer Lending Companies to Watch in 2018-2019. Here are just a few of the most important. The undisputed king of micro investing, this nonprofit was founded in 2005. Since then, they’ve grown to fund over one billion in loans over several million borrowers. As a nonprofit, Kiva takes no fees or interest on loans. However, lenders themselves are free to set interest, which can run as high as 30%. Despite that, the company has made a genuine difference in the developing world, allowing countless entrepreneurs to pull themselves out of difficult circumstances. Prosper was the first P2P lending platform in the US, and is still one of the largest. Over $7bn in loans have passed through the company. Aside from being first to market, Prosper is also home to an innovative system for determining creditworthiness. The company screens for creditworthy applicants based on FICO score, and also assigns their own “Prosper Rating”. This is a proprietary algorithm that takes a number of nontraditional factors into account, including loan history with Prosper itself. Serving the UK and Australia, this London-based firm has handled over £2.5bn in loans since their 2010 launch. The company was the first in the P2P industry to protect lenders from bad loans. Using fees charged to borrowers based on their credit profile, RateSetter maintains a £29mm “Provision Fund” that is used to reimburse investors in the event of a default. The fund is a success, as RateSetter claims that none of its individual investors have ever lost money with the company. RateSetter also is one of a limited number of peer to peer lenders to provide business financing as well as personal loans. Zopa was the world’s first peer to peer lending company, launched in 2005 in the UK. Any doubts about the staying power of this technological phenomenon can be put to rest by looking at the father of the industry. Zopa has consistently grown over the past decade, and today has processed nearly £4bn in loans. The company is expanding into traditional banking 2018, albeit a bank that is powered by new open banking technologies. This may be mirrored by the rest of the industry, or Zopa may be an outlier. However it shakes out, it seems certain that Zopa will continue to thrive. Now that we’ve looked at some of P2P’s biggest successes, let’s go back to basics. What does peer to peer lending mean, exactly? Put simply, peer to peer lending uses technology to make loans less expensive for lenders. The dozens of fees and middlemen associated with old-school banks are no longer a factor, making returns effectively much higher. P2P lending companies almost always operate online. The market is enormous, because lenders can invest in loans worldwide. Lenders can also band together, with multiple investors chipping in to fund a single loan. Depending on the platform used and the lender’s choice, the interest rate can vary. Installment plans, early payback, and many other features of traditional loans may also be available. In addition to personal or commercial loans, P2P lending also encompasses two specialty markets. Typically limited to the nonprofit sector, P2P fundraising relies on supporters of a cause to solicit donations from their own social networks. Each donor is given the opportunity to create their own fundraising page or portal, and to share it via social media, QR code, or however they see fit. The role of the technology partner here is to provide an easy to use, attractive page template, and to manage the funds coming in from many disparate sources. At regular intervals, or at the end of a predetermined campaign run time, all the funds are pooled together and presented to the receiving organization. In return, the partner typically keeps a percentage of donations as their fee. Contact information for donors may also be kept, enabling the partner to market other campaigns to them. Directly charging the receiving organization for service is rare, but not unheard of. Crowd-investing, or equity crowdfunding, couldn’t be more different. Designed for startups to secure funding in an increasingly competitive VC landscape, companies like Crowdfunder and MicroVentures allow ordinary consumers acquire interest in early-stage, unlisted companies. In plain English, this means that anyone can go onto one of these platforms and invest in a promising startup, before it ever hits the stock market. They essentially become angel investors, putting capital into a new business before it’s even close to turning a profit. The difference between crowd-investing and peer to peer lending is similar to the difference between owning stock and providing a loan. Unlike lenders, investors don’t expect to receive a set amount of money back. Rather, the return on their investment is tied to the performance of the company. If the company does well, then investors can receive many times the amount they put in. If the company tanks, then the investment is lost. All three forms of peer to peer financing are making their mark on the world. There are several reasons why peer to peer lending trends so highly in 2018. Like so many recent innovations in software, P2P lending supercharges efficiency by removing the middleman. A traditional loan typically involves a bank funding loans via the deposit accounts of its other clients, and through interest and investments made with those funds. It’s a huge organization with hundreds or thousands of employees, and the amount of red tape involved is legendary. Borrowers end up paying massive fees and interest just to keep the bank running. By contrast, a peer to peer lending platform works at the speed of light. Although it is still technically a middleman, the platform is largely automated, and can operate on a far thinner margin. Funds are provided directly from the lender to the borrower, without needing to pass through innumerable accounts, calculations, and holding periods. The net result? Peer to peer lending is cheaper, faster, and easier than its institutional predecessor. At the same time, peer to peer lending allows for money to make its way into places where institutions fear to tread. People with low or no credit, or other people whose life circumstances preclude them from traditional loans, are finding freedom and opportunity in P2P. Whereas a bank cannot make a loan decision based on “the human factor” of taking a risk and doing a good deed, individual lenders have no such restrictions. And amazingly, many lenders respond to that. People are choosing to help people even if they might not receive anything back. For these lenders, the idea that they’ve contributed to helping a disadvantaged person get out from under debt, get off the street, or achieve their lifelong small business dream, is a powerful one. And the fact is, the investment pays off more often than not. What makes modern peer to peer lending possible is its distributed nature, thanks to the web. A person seeking a loan need not go begging for the full amount, which may be a difficult ask. Instead, the P2P platform collects money from multiple lenders and provides them as a lump sum to the borrower. This differs from institutional banking because lenders maintain full control of where their money goes. Whereas a bank simply takes deposits and uses them to fund loans, without the depositors’ knowledge or input, a P2P platform provides transparency. Lenders know exactly who is borrowing their money, why they are borrowing it, and when it should be paid back. In addition, the interest for these loans goes directly back to the lenders. In today’s digital age of educated consumers, that’s a massive advantage. What else distinguishes peer to peer lending from traditional banking institutions? Despite its many advantages, peer to peer lending is only just now entering the mainstream. Banks have largely steered clear of it, or have dipped in and then back out. The reason is that peer to peer lending is so fundamentally different from traditional loans, and so heavily weighted in favor of the consumer, that it’s difficult for banks to turn a profit. Lenders can have several motivations. They might be looking to turn a profit, as P2P lending typically offers great returns. They might be hoping to make a social difference, by investing with the disadvantaged, those down on their luck, or in third world countries. Or they might simply distrust traditional banks, a feeling that is growing more common amongst younger generations. Whatever their reason for turning to P2P, lenders can find a borrower that matches their goals. Most platforms are set up more like eBay than a bank. Users can browse through loan requests and offers like they would shop for used electronics. The result is a far more personal, more involved, and more tailored experience. People know exactly where their money is going, and they can decide for themselves if the benefits of any particular investment outweigh the risks. For institutions, peer to peer hasn’t turned out to be a significant source of revenue. For individual lenders, the opposite is true. The personalized, distributed nature of P2P means that lenders can optimize their portfolios to an unprecedented degree. And no matter how much or how little funds they have to put in, they can spread that money out between as many different loans as they feel comfortable. The result is that, for smart lenders who put in the time and effort, rates of return are sky high over banking interest or even traditional investing. An ROI of 15% is not unheard of, with most lenders bringing home from 6%-8%. Meanwhile, the platforms themselves continue to grow. Shepherding these investors to success is proving to be a strong strategy for fintechs. At the same time, those fintechs are in competition for the limited pool of borrowers and lenders. Unlike institutional banks, these platforms don’t have the backing of governments, nor the reputation that comes with many years of operation. Instead, platforms must compete where it matters: By serving their customers well. The peer to peer lending industry is still new, and it’s far from certain which of the hundreds of platforms will enjoy long-term success. Like any technological field, innovation is key. The company that can bring something genuinely new and useful to their customers first will gain an advantage. The company that can do it while providing excellent service, safety, and ROI will win the game. Let’s set aside all the high-concept analysis for a moment. What does this technology actually mean for the users? For lenders and borrowers, there’s only one thing that matters: Money. And it’s here that P2P truly delivers. Many borrowers in the P2P space are what would traditionally be called high credit risks. They may have low credit, or no credit. They may live in a country where credit ratings don’t really exist. In traditional banking, that’s the end of the road. Without a solid credit rating, it’s not possible for a bank to lend to them. Their regulations won’t allow it. With peer to peer, a loan is within reach. Especially when paired with other techs like big data analytics that can further evaluate creditworthiness on non-traditional criteria. Individual lenders on these platforms can evaluate risk based on criteria other than credit rating. Income potential, education, and a simple human factor can all come into play. On some platforms, as you’ll read below, these factors can even be packaged and presented to lenders to aid in their decision. The result: Peer to peer lending lets people borrow money, even if traditional banks are closed to them. Lenders, meanwhile, maintain an unprecedented degree of control over their investment portfolios. By evaluating potential loans on their own, using information and tools provided by the platforms, they can fine tune their investments to an unprecedented degree. And for educated investors, that can mean unprecedented returns. Forbes estimates that, used correctly, P2P loans can result in returns of up to 20%. That’s just not possible with traditional financial instruments, and rare even in the stock market. In fact, Forbes goes on to state that a well-maintained portfolio will earn up to 50% above the average deposit rate. The result: The numbers speak for themselves. P2P is a moneymaker. If you’re exploring how to start a peer to peer lending business, or need to update your existing offering, then the first step is obvious. You need a technology partner. A team of developers who understand the tech, the industry, and can help bring your vision to reality. Ignite has been in business since 2006, and has completed over 150 successful projects since then. With facilities in Israel, Ukraine, and across Europe, the company is the perfect match for fintechs or entrepreneurs anywhere and at any stage of growth. Ignite is expert not just in P2P lending, but also in blockchain, cloud computing, and a host of other technologies crucial to modern business. To get started, fill out the contact form below. A consultant will be in touch ASAP. Previous Post Can Capsule Endoscopy Technology Keep You Out of Surgery?